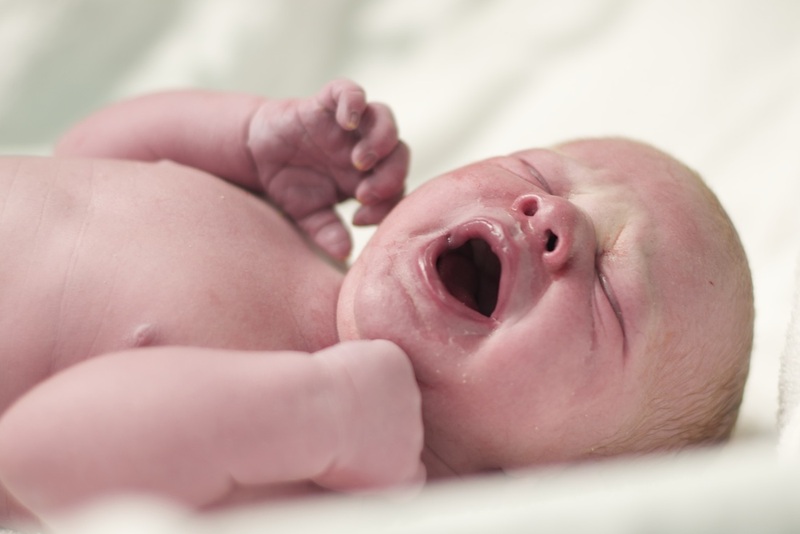 It was a bit of a whirlwind for this Birth Photographer. Mom and I came up with the game plan on Friday night, and by Tuesday morning I was there with my camera fully charged, ready to capture a special birth. As I left for the hospital, a text arrived indicating the scheduled cesarean might actually be a bit ahead of schedule. Determined not to miss the moment mother and father first meet their baby girl, I put the pedal to the metal and raced (just slightly above posted speed limits) to Saint Joseph's hospital. Hugging the twists and turns of the road, I paused to think how surreal it all was. It was exactly four years earlier - almost to the day - that my husband had raced me down the same roads to the same hospital where our son was born by cesarean. Funny how life works out sometimes. A little breathless, I arrived to find Lyndsay and Daniel quietly checking their phones as they fielded continuous requests for baby updates and patiently waited to meet their baby daughter Charlotte. I suited up in a pair of pretty blue scrubs and started snapping photos of all the beautiful details in the room. After a kiss goodbye, Mom was on her way to the OR and Dad and I were left to wait a while longer. ​Impressed with the calm demeanor I'd witnessed from both, I already knew the answer when I asked him, "Are you nervous at all?" He scrunched up his face and shook his head, then sat back to tell me how he'd learned to work through nervous energy after receiving some sage advice from the coach of his high school ski team. He told me how he was rarely phased these days, and I was glad for his peace of mind at such a pivotal moment. Little did we both know that this dad's cool was about to be tested to the max. 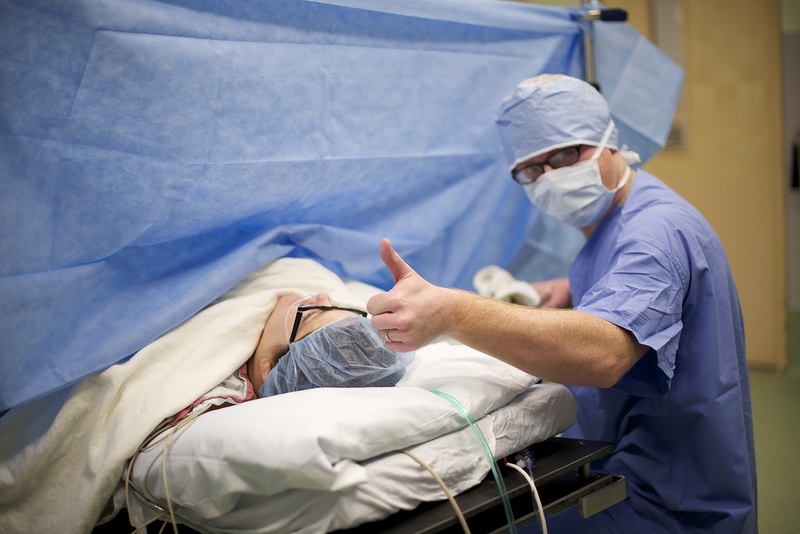 Inside the operating room, everyone was quiet as we stood back and allowed the staff the space to do their work. I felt so honored and blessed to be in that room. Not only did this beautiful family allow me to come in and share these sacred, private moments with them, but the hospital staff also welcomed me and generously gave me space to do my work. I'm truly grateful. Except to give me this brief thumb's up, Dan's hand never left its comforting position on the top of Lyndsay's head. For several minutes we waited in silence, wondering when baby Charlotte would finally appear. Would she cry when she came out? Would she look like her big sister Maddie? What color hair would she have? Lyndsay joked with Dan, softly telling him, "I'm just afraid she's gonna come out and then they tell us it's a boy." 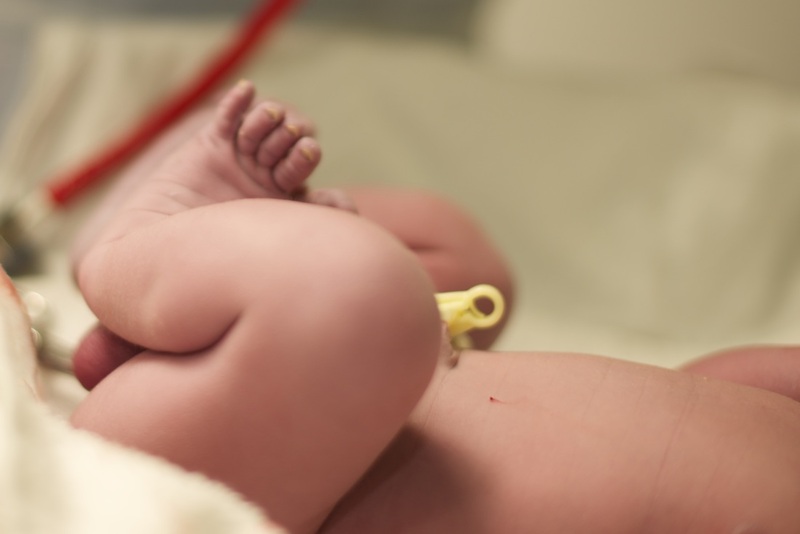 I chuckled softly to myself, remembering those same fears of a gender surprise every time I went in to birth. At last we heard a tiny gurgle followed by a brief cry. Baby Charlie was out! 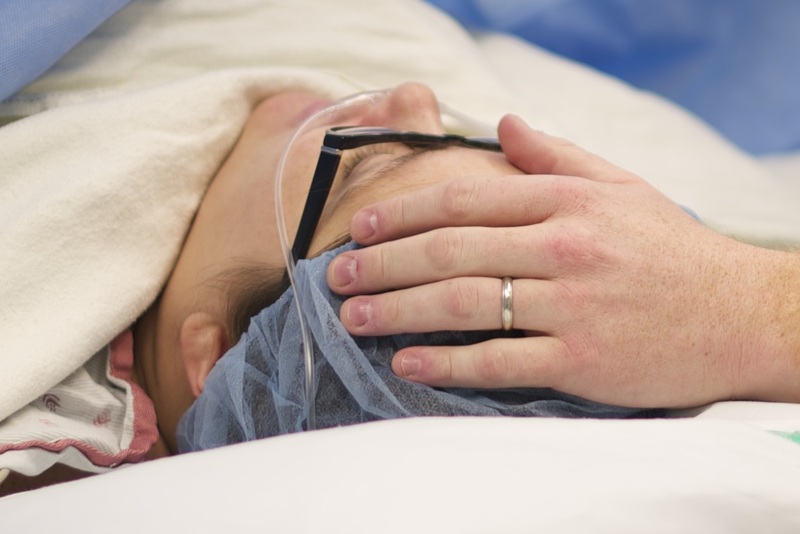 The midwife mumbled behind her surgical mask, "Now what did we say this baby was supposed to be?" I smiled, assuming she was teasing Mom and Dad about baby's gender - trying to keep them guessing in a world where 20 week ultrasounds reveal our babies' gender half-way through pregnancy and take all the guesswork out of preparing. I readied my camera to capture Baby Charlotte's debut over the blue curtain. She appeared just then, beautifully pink, squishy, wailing, and completely, utterly, without a doubt - a boy! 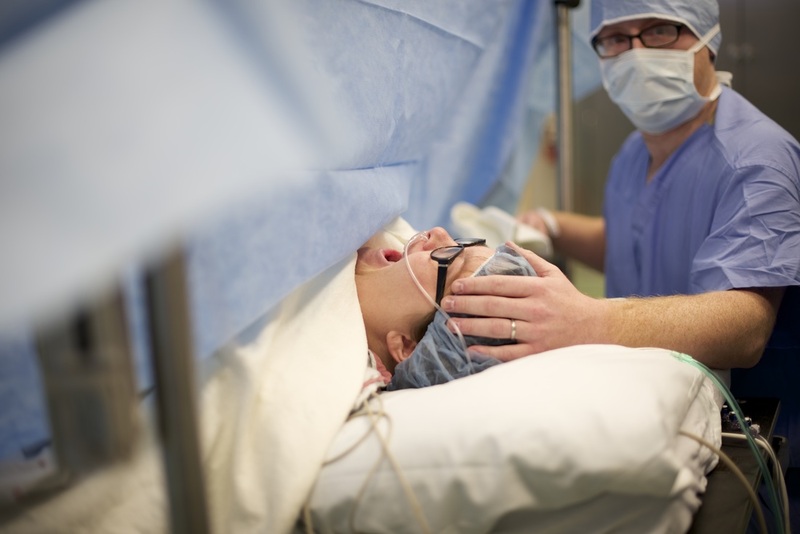 The entire operating room burst into uproar. We were all shocked and delighted! Mom began laughing and crying simultaneously, while Dad stared in disbelief and kept uttering the word, "Wow!" One thing is for sure. Girl or boy, this baby is beautiful, absolutely perfect, and absolutely loved. And when he finally got his mama back, he latched on to nurse and didn't make a peep for ages. The grandparents were called so Big Sister Maddie could come meet the newest member of the family. 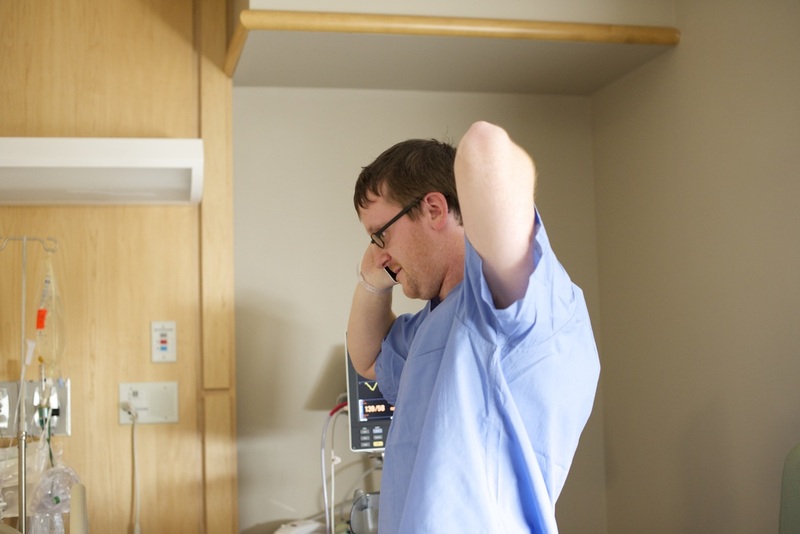 Dan was visibly struggling as he spoke with his mom, choosing each word carefully so as not to give away the surprise news that they had decided to deliver in person. Lyndsay called her mom and dad to tell them, "Yup, Baby is here. 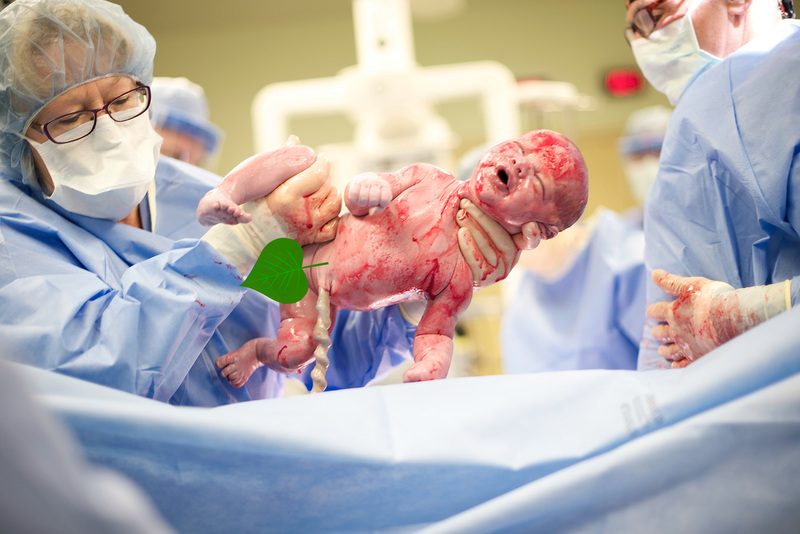 Well, we got the surprise of a lifetime..."
And when the grandparents arrived with the big sister ready to see her mama and meet her new baby, well, it's just one more moment of this amazing birth that this photographer is SO happy she was able to capture. 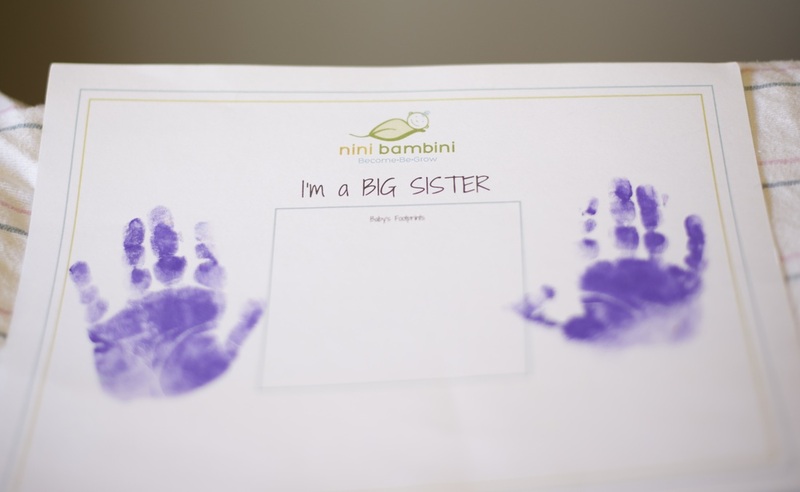 Big Sister completed the siblings course at Nini Bambini in Bedford, NH. 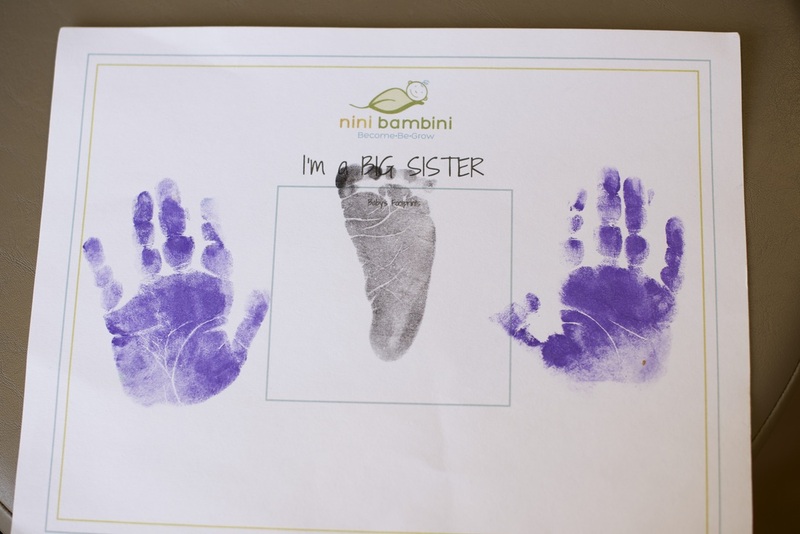 Her certificate only awaited a newborn footprint.